If you go to Legoland, be sure to visit the NXT mindstorms lego class. Sign up outside the Einstein statue early in the morning before classes fill up (ages 10+). There are two versions of the class-Mars or the Human Body. I did the Human Body class. Each kid was given a robot, a computer, and other lego accessories. The first thing you had to do was program you NXT robot to use its color sensor so it can navigate the red veins of the human body model. Next, you program your robot to pick up blue blood cells using a fork lift. Then you switch the fork lift accessory for a saw accessory. Next, you program your robot to cut a "bad" blue vein using the saw attachment. Time for another accessory change to a ball holder. Your mission is to take 4 medicine balls to the heart and drop them into the right spot. After successfully programming it to drop balls, you then program it to launch balls. We ran out of time before I got to launch my ball at the target. The class lasted about an hour. I do want to do the class again but I would like to try the Mars missions. Programming the robot was tricky because you had to measure the distances and put in all the right and left turns. 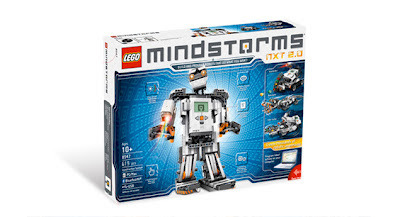 Other places offer NXT Lego Mindstorm classes including many rec centers. You can also buy the kit and practice at home.